Like all other journalists, I get a call about “peace” demonstrations organised by the ruling party, the National Council for the Defence of Democracy–Forces for the Defence of Democracy (CNDD-FDD). Government spokesmen call on all media outlets and individual journalists and use social media to publicise the event. 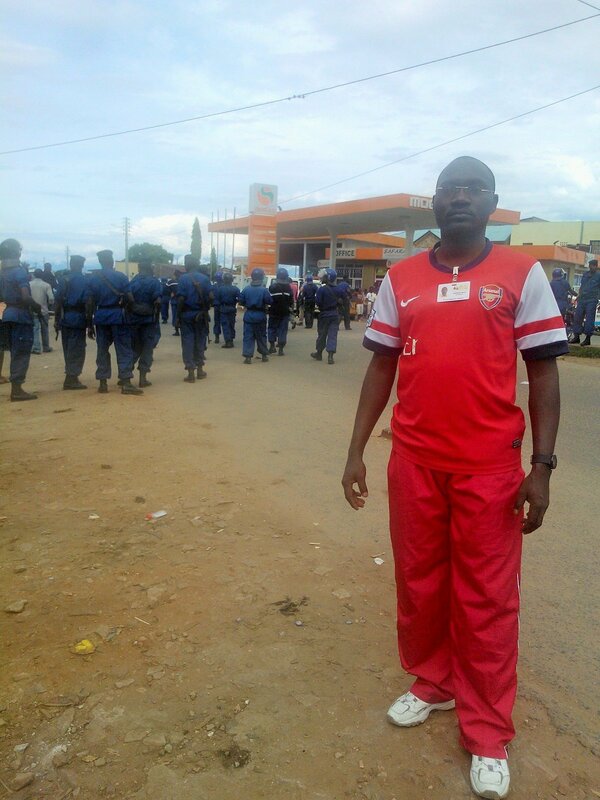 The aim is to demonstrate a show of support for President Pierre Nkurunziza’s controversial bid to run for a third term in elections due in June. During the event, led by party chairman Pascal Nyabenda, some of those marching cry out “tuzobamesa!” to bystanders. In Kirundi, this literally means: “We’re going to wash you!” But it reminds me of the language used during the 1993-2005 civil war, when a variant of the same verb, “mumese!” was clearly used to mean: “kill him!” I am one of the “grenade generation,” those who were in secondary school during the 1990s, when grenade attacks on schools were commonplace. I learn that the ruling party’s congress has officially endorsed Nkurunziza as its candidate even though he has already served two five-year terms as president. This should preclude him from running, although his supporters say the first one didn’t count because he was appointed by parliament rather than elected by public ballot. This is when I begin thinking about my family: my wife and my two children. Civil society organisations, opposition parties and even parts of the CNDD-FDD opposed to Nkurunziza’s candidacy announce they will take to the streets. Until now, I’d thought things would calm down and the president, content with his two terms, would let others succeed him. Polls have put his party well in the lead. 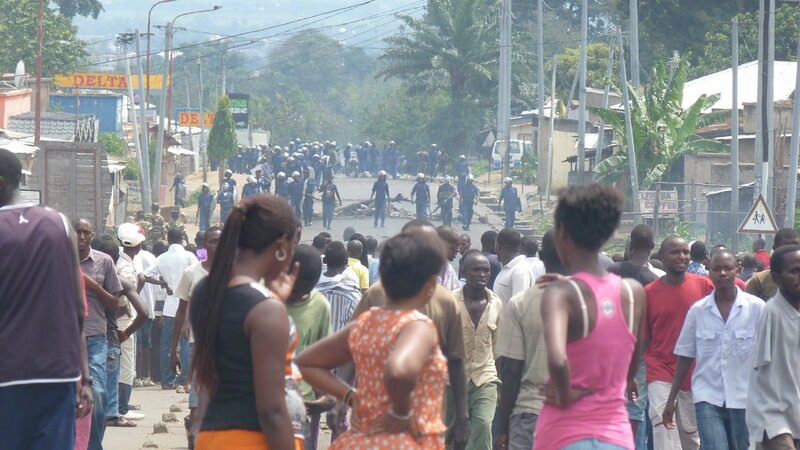 The streets of Bujumbura are packed with demonstrators. At around 8:30am, I take some photos in central Bujumbura’s Nyakabiga district. Police begin to break up the protests with teargas. With no protection, I run for cover. I see children crying. Some police appear to be firing live rounds. What affects me most is the death of a 15-year-old boy. I had just left Mutakura, in the north of the capital, when a colleague called me to say an adolescent had been shot in the head while he had his hands in the air. His name was Jean Népomuscène Komezamahoro. Born in 2000, he was the same age as the Arusha Peace and Reconciliation Accord, which paved the way for the end of the war. I saw women weep when they learnt that the boy was dead. That night, I got a call from the same part of town. I was told that uniformed men had burst into a home, killing two people, including a 40-year-old man who worked for Toyota Burundi. I leave the capital to go to the Musaga neighbourhood in the south of Bujumbura. 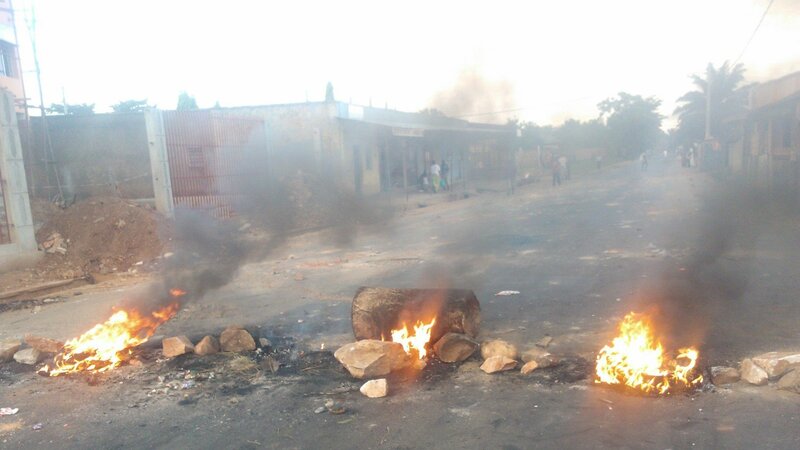 Protestors here are more hardline, determined to take on the Nkurunziza regime. The previous day a man had been shot dead. Protestors blamed the police and intelligence services. Today, I witness the forced closure of Radio Publique Africaine (RPA), the most listened-to radio station in the country. Back in Musaga. Some colleagues and I come under fire. Nobody is hurt. A rubicon of press freedom is crossed when social media and mobile phone networks are cut. This is a big problem for journalists. I learn that members of the Imbonerakure (the CNDD-FDD’s youth wing) armed with clubs have targeted colleagues from Bonesha FM. Later, I hear that police shot at RPA journalists in Mutakura the previous night. My three-year-old son starts asking questions like, “Daddy, did they shoot at you? Tell me, Daddy, who shot at you? And why?” I don’t reply. One thing is clear though: the troubles have reached the hearts of children, including my own. I decide to move my family far from the city. I am not the only one. It’s normal in times like this. Early in the morning, we drive south to Musaga and I try in vain to get my family out into the countryside. A group of protestors at a roadblock recognise me as a journalist. They say they sympathise but if they let us drive through everyone else will ask them too. They suggest I hand over my family to let them through to walk to the bus on the other side of the district. I refuse and return home. It’s the same story to the south in Kanyossha. Again, I can’t get through the barricades. Night brings good news: a two-day truce to bury the victims and give the president time to rethink his decision. We pack the bags again. At around 6am on Sunday my son waves goodbye to me. He is leaving with his baby sister, my wife and three other family members, with a plan to come back when calm returns. But where will stay calm for sure when different communes are beginning to join the movement? I notice two young strangers in front of my house as I pack up the car. I zoom in on them with my camera. I head downtown to work as usual. Showing my local press card, I am able to get though the barricades. The protestors are not always friendly to journalists who are close to the government. Sometimes we are manhandled by the police and the Imbonerakure. At midday I see protestors clashing with police. 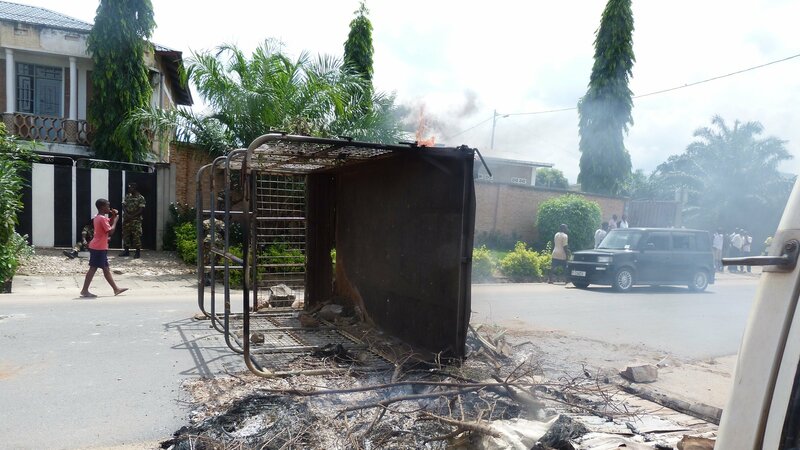 The protestors wanted to block the main road running through Bujumbura, Boulevard 28 Novembre. Live bullets were fired at the protestors and grenades went off that injured some police officers. The wounded cried out. Some protestors had blood on their clothes. There was no sign of ambulances. Later I learned that even the first lady had to turn back when her convoy tried to cross the Republic Bridge, which lies on this boulevard. Frightened by the gunshots, the explosions, I sought out a calmer location. A 12-year-old boy was among three people killed today. Forty-five people, as well as 15 police officers were wounded. I decide not to work today. I need to rethink my personal security strategy. But tomorrow I have to resume my duties cover the burial of corporal Euraim Hatungimana, shot while he was protecting demonstrators, apparently by a secret service officer. I want people to understand what is going on in Burundi, especially over recent days where the rights of children are violated by demonstrators and the police. That’s something they have in common. بعد مرور أسبوعين على اندلاع معركة استمرت خمسة أيام في شمال غرب بوروندي، لم تظهر تفاصيل تذكر حول المجموعة المسلحة التي دخلت البلاد ولقيت هزيمة في نهاية المطاف على أيدي الجيش الوطني.